Hit town at the right time of year, however, and things seem downright festive. Traffic in the farming community increases suddenly in early September. There might be a laid-back parade, an old-fashioned baby contest, a tractor show, a veterans memorial service, and an enthusiastic choir from neighboring Brookfield, not to mention a hot-air balloon race. It is all in the name of one man. General John Joseph Pershing was born near Laclede on September 13, 1860. In time he would become Missouri's most famous son after Samuel Clemens while attaining the highest rank in American military history. His name would be linked with the 10th Cavalry, Pancho Villa, and, above all, World War I.
Jack's father, a merchant and traveling salesman of German extraction, moved the Pershing family to a fine twostory home in the center of town early in the boy's youth. The Pershing home is now maintained as a state historic site. Pershing Days is an annual event that brings out the county populace. A block from the square, the L-shaped Pershing boyhood home with its gingerbread ornamentation has been restored to its 19th century condition and furnished in the middle-class style of the Pershings. Upstairs are displays relating to Pershing's life and career, including photos, medals, weapons and a World War I uniform (not the general's). Just north of the house is a small veterans memorial with granite walls inscribed with names of veterans from several wars -- mainly from the Great War so central to General Pershing's career. The walls encircle a statue of Pershing that once stood on the capitol grounds in Jefferson City. Services are held on the site on Memorial Day and Veterans' Day. The Prairie Mound School, where Pershing taught as a teenager, has also been moved to the grounds. While all major cities in Missouri have something bearing the Pershing name (be it a school, park or street) and the military has used the name on weaponry, few Missouri school children today learn who he was. Fewer still know of his Missouri background. Teaching in a one-room school at the age of 17, Jack Pershing could hardly suspect he would soon begin a military career that would span the Indian wars to the nuclear age. He would advise presidents and kings and organize the first American army ever to set foot in Europe. In retrospect, it all seems unavoidable for a boy of war-tom times -- born during one major conflict, commander during another, and dying shortly after the greatest war of the 20th century. Pershing was attending a teacher-training school in Kirksville when he saw a newspaper advertisement for the U.S. Military Academy. Hoping for a free education, he sent for and passed the entrance exam. He was graduated from the academy in 1886, rode with U.S. troops against the Apache and other Southwest tribes, took a post as military instructor at the University of Nebraska and earned a law degree. While teaching tactics at West Point, he was assigned to lead a cavalry unit in Cuba during the Spanish-America War. This turned out to be the storied 10th Cavalry, a tough all-black unit. It participated in the charge up San Juan Hill (Kettle Hill), even rescuing Theodore Roosevelt's Rough Riders from a sticky situation that the future president would forever be reluctant to acknowledge. Pershing became widely known in the army as "Black Jack" for his leadership of the 10th. Although other white commanders had led the 10th Cavalry, the name stuck with him the rest of his life. He received the Silver Star for gallantry in action for service in the Cuban conflict. He was next bundled off to the Philippines, where he was at length promoted to captain. There, his men subdued the rebellious Moro tribe led by Muslim priests. In a bully move, Roosevelt (now president but always called "Colonel" Roosevelt by Pershing) was so impressed he had Pershing promoted from captain to brigadier general -- over 862 higher ranking and quite disgruntled officers. He served as governor of the Moro Province, then was sent as a military observer in the Russo-Japanese War. He returned to the Philippines before the army decided to bring him stateside for a semi-normal life with his family. He was commanding officer of the 8th Brigade in a comfortable if unspectacular role in San Francisco, where he and his beautiful wife Frances Helen, daughter of Wyoming Senator Francis Warren, lived with their children. Tragedy changed everything in 1915. A fire at the Presidio while Pershing was away took the life of Frances and their three daughters. Their son, Warren, was spared. The general responded by becoming a hardened, aloof, and rather cold career man, seeking assignments that would occupy his life wholly. It was Pershing who spent 1916 chasing the Mexican revolutionary Pancho Villa around the Southwest and drawing national attention. Because he was the only commander continually engaged and in close proximity, the army sent him newfangled weaponry to test in the field. Villa was never captured, but the pursuit broke up his following. Pershing was promoted to major general, and his experience with modern weapons sealed his fate. mounting since the war of 1870. With contradicting treaties and suspicious military plans, it took hardly a lighted match to begin the Great War. In the United States, President Woodrow Wilson resisted pleas from both sides to enter the gruesome melee. American business was making money from most of the combatants. and there was little precedence for creating a U.S. alliance with any specific nation. But this war would set many precedents for American policy. Pershing, however, supported and expected American military involvement, frankly hoping for a chance at some kind of leadership. Two years after a German U-boat sank the Lusitania, the United States Congress did declare war against the Central Powers in 1917 and plucked Pershing out of the west. There were at least five other major generals with seniority, including Leonard Wood, but the Missourian received the charge to throw together an American Expeditionary Force (AEF). The appointment surprised few. Often disgusted at the lack of preparation of the American troops and the administration's lack of appreciation of the time and effort required to prepare them for effective service, Pershing set to work organizing some semblance of an army from scratch. In his memoirs, he would later detail the almost farcical condition of the army at that point. The AEF was the first American army ever sent to Europe. Although the men did fight under other flags for a time, Pershing refused to comply with Allied requests to use his men to fill the holes in their lines. They were to fight independently under American commanders or not at all. Only in a crucial circumstance did the general bend this dictate, despite angry backlash from Allied commanders. Despising the trench warfare that had extended the war so long, Pershing found himself mired in the same predicament for a time. He upbraided other generals for old tactics that caused ceaseless slaughter in the face of modem weapons but was hard-pressed to work up other solutions. Finally, the Ist Army, fighting under the U.S. flag, wiped out the angle the weakening Germans had held for three years. This opened the way for the Argonne offensive. Pershing transferred 600,000 men to the Meuse-Argonne front and began a 47-day campaign in the rough, forested territory. It was big move that paid off. Doughboys smashed through the Hindenburg Line to emerge at Sedan. The war was waning. By this time Pershing was a household name in Europe and America, sharing the headlines with Kaiser Wilhelm, Paul von Hindenburg, Sir Douglas Haig, Joseph Joffre, T. E. Lawrence, and the abdicated and doomed Tsar Nicholas. On 11 November 1918 the war ended with an armistice. This was against the wishes of General Pershing, who wanted a German surrender. But he returned home a romanticized national hero and led his troops through parades in New York. The rank of general of the armies was created for Pershing. It was the highest rank ever accorded an American military person. The rank was later posthumously given to George Washington and during World War II was conferred on Generals Marshall, Eisenhower, McArthur, and Bradley. his blunt, no-nonsense manner won devotion from the troops. "He's a fighter, he's a fighter, he's a fighter," was the highest accolade a soldier could hope to hear from the general. 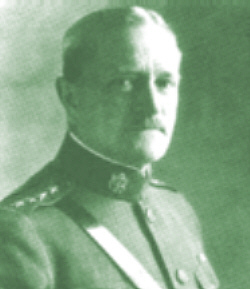 Pershing served as army chief of staff in the early 1920s. His memoirs, My Experiences in the World War, won the 1932 Pulitzer Prize for history, although causing a rift with the French that seems to exist to this day. The general leveled almost as much criticism on the French and British commanders as he did on the U.S. Congress. A Missourian to the core, he did not sugar-coat his opinions. He was a consultant to the military and the Franklin Roosevelt administration during World War II, then left the service with the understanding he would not be officially retired until after his death. As a Missouri sidenote, Harry Truman worked the old 75s in the field artillery unit of the 35th Division during the Great War and consulted with Pershing while vice president of the United States. General Omar Bradley hailed from the tiny town of Clark, about 60 miles from Laclede. Pershing died 15 July 1948, in Washington, D.C. He is buried at Arlington National Cemetery.